I think Aunty Jenny would like Penny’s latest Blog! Many years ago my husband Sandy and I paid a visit to his Scottish aunt. Auntie Jenny was a large and formidable lady of trenchantly conservative opinions and a bit scary: it didn’t do to disagree. One of her favourite phrases was “I dinnae approve”. But we soon discovered her softer side, and she quite enjoyed a little gentle leg-pulling. She was also a gardener and had a large plot full of special plants. I was becoming interested myself and she was happy to encourage me. I noticed that she always had an unusual arrangement of flowers on her dining table. It consisted of a low round bowl (I think it was a dish intended for serving vegetables) filled with sprigs of a feathery conifer, into which she inserted examples of whatever happened to be blooming at the moment. The conifer provided support and an attractive background for the flowers which could be easily changed as they faded, and it looked very pretty. Back home I intended to copy this charming idea, but I met with a snag. I realised that it only worked with a very specific conifer, and I didn’t know what it was called. 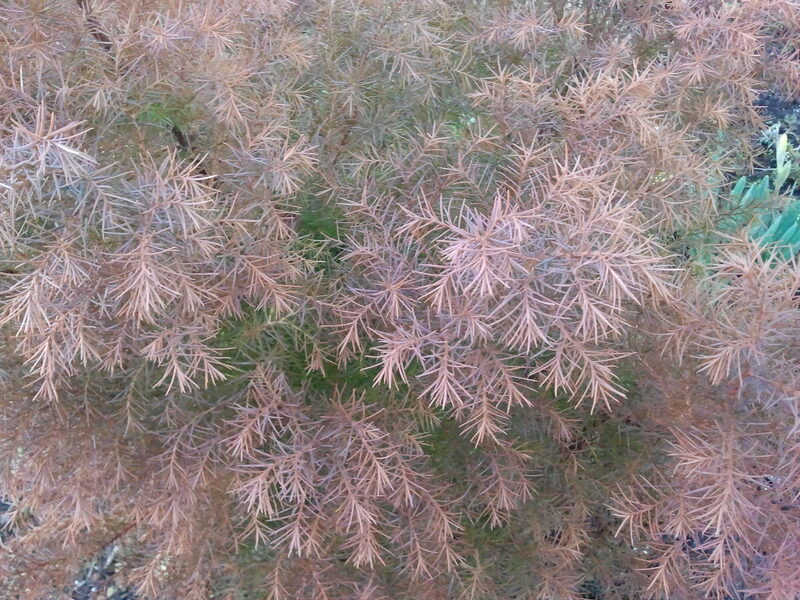 Once or twice I spotted something similar – without a label – and it took a lot of research to discover that it was Cryptomeria japonica ‘Elegans’: a form of the Japanese Cypress. Further reading informed me that it would eventually make a small tree, (which I didn’t have room for) but there is a smaller form: C.j.’Elegans Compacta’ which, according to Hillier’s Guide “forms a billowy bush”. It turns a rich russet brown in winter, and, unlike many conifers, it doesn’t mind being cut back. I bought one, I planted it, and it grew quite slowly. It is now about a metre high and at last I feel able to gather a few stems for my first ‘Auntie Jenny arrangement’. It’s been a long time in the making (at least 40 years!). 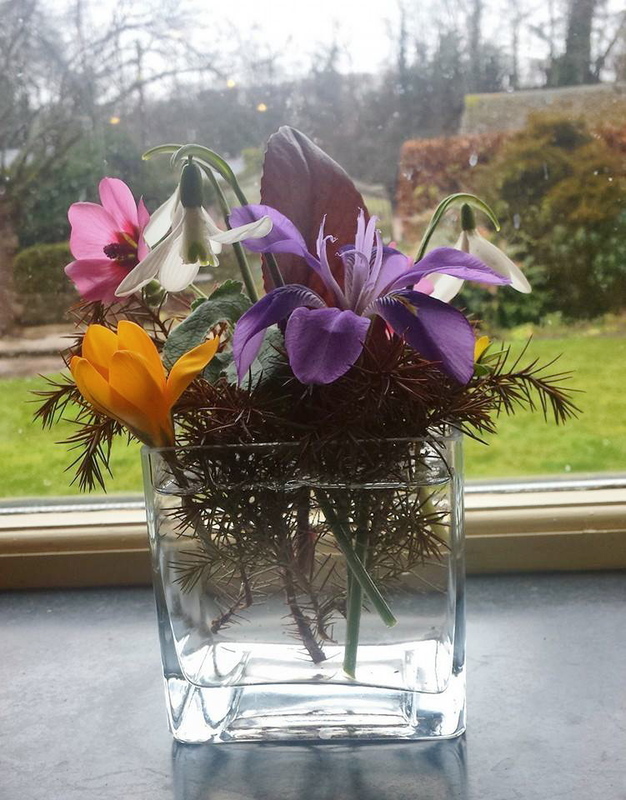 The idea is particularly well suited to February, when flowers are scarce and I don’t want to pick too much. Along with snowdrops, crocus, winter aconite and iris, I have used a couple of flowers of the glowing pink Anisodontea ‘El Royo’, which has been flowering in my cold greenhouse all winter. Auntie Jenny died many years ago – but if she is looking down from heaven, I think she would approve. Occupy the Green Party: Why Support for Britain’s Political Left Is Surging.